There are things that we call weird. Then, there are things that we call super weird and in the end, there is Ranveer Singh. The man who doesn’t care about what he is wearing. No doubt, he rocks some of the most bizarre fashion styles. Ranveer Singh- Bhai Jo Kuch Bhi Phenta Hai! He is certainly an amazing actor but his dressing style sometimes reaches the peak of weirdness. Till now, in his acting career, he has sported some pretty bizarre costumes with fans appreciating it. What was he wearing anyway? For the premiere of his upcoming film, Ranveer along with the Director Zoya Akhtar and Co-Star Allia Bhat was visiting Germany to attend the Berlin International Film Festival. 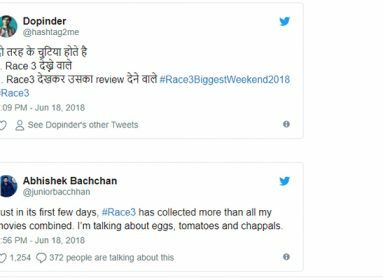 Critics have already mentioned their review for the movie “Gully Boy,” by titling it as a huge entertainer. But, it was not his film what people were talking about, it was his blue sweater that grabbed all the attention. Remember James P. Sullivan? 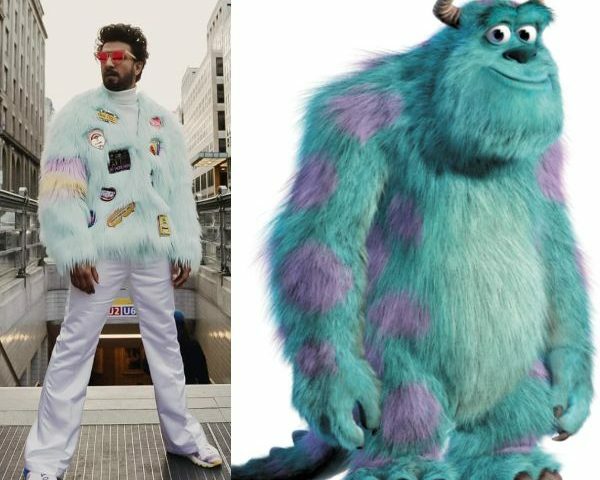 Big blue furry monster from the Disney movie “The Monsters Inc?” Well, Don’t you think Ranveer is looking like just the same? Designed by Manish Arora, Ranveer Singh’s blue fur jacket has patched stickers on it. Gully Boy sticker printed on the right arm (maybe for the promotional purposes) and patched sticker all over on the front side. Although, Ranveer captioned the picture with “Gangsta of Love,” but there is no way fans are going to take is serious. After all, he is looking like our favorite furry monster who is not a gangsta but a sweetheart. The jacket was still Ok but y steal the fridge magnets? With this picture, Ranveer has made it clear that he can rock anything. From his quirky zebra print suits to eccentric gender-fluid clothing, Ranveer Singh is not afraid of experimenting with his clothes. Ranveer Singh’s Blue Fur Jacket avatar proves that he is the Indian Lady Gaga!